No advertising... No selling... Just sincere, honest advice. In a place known as the Six Villages, a place very much like our world and a place also unlike our world, falcons are the central animal in the lives of a people known as the Uztari. Think of a place for kids who grew up on How to Train Your Dragon, only with falcons instead of dragons. 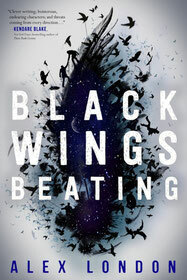 If you consider what such a world would be like, you’d only come half as far—or do half as well—as Alex London has done in Black Wings Beating. He has created a world that in every way seems realistic, from personalities to language. If there is a world where humans regularly look to the sky for companionship, competition and war, it will look, breathe and sound just like the Six Villages. London is that good at world-building. London is also that good at creating fantasy allegories that eerily pattern our own 21st century (read his magnificent Proxy), for he presents, as well, the Kartami, an extremist religious gypsy people who threaten to purify the Six Villages. Yes, we're talking genocide here. But more than that, and more engaging than even the eerie realism, Alex London creates characters that readers care about. Twins Kylee and Brysen soon find themselves at the conflict’s center. Kylee has a “once-in-a-generation gift” for falconry, yet all she wants is to be free of it forever. All Brysen wants is to be with his boyfriend and trainer, Dymian. By selling birds at market, the twins almost earn enough to pay off their late, abusive father’s gambling debts and fulfill both their hearts’ desires. But lovelorn Brysen gets swept up in Dymian’s debts and agrees to capture the dangerous, elusive ghost eagle in order to save Dymian’s life. Kylee secretly follows. The story, told through multiple third-person perspectives, soon reveals that more than just Dymian’s life rests on the twins’ shoulders. With political intrigue, epic battle sequences, jolts of romance, and strong female and queer characters, there’s a lot to pique readers’ interests here. But it’s the unique worldbuilding and beautifully complex sibling relationship that make this a must-read. It requires careful reading to keep track of the names of the lands and people, but no more so than the average high fantasy. What you get in return here, however, is a fantasy that reminds you that it is the root of the word fantastic. This is a world from start to finish that feels so believable that you want to take your time reading it, Alex London writes adventure like the masters do. It is adventure rich in nuance, depth and three-dimensional characters. This might not be a book for everyone, but it is a book for anyone who likes fantasy. It is also likely to be the kind of book people will talk about for many years to come as an icon of classic 21st century fantasy storytelling. What kid doesn’t see roadkill on the curbside and not want to take a closer look? Many, you say? Well, those aren’t the people this book is for. For the rest of us, Heather L. Montgomery's—er, fresh take at splattered creatures reveals the—well, the inside story of this—um, track of the animal world. It’s an engaging, enthusiastic, storytelling-style examination that begins with a dead rattlesnake she discovered one day near her home. Unable to resist the snake's, um, charm, she digs right in and dissects it (noting, properly, that she made a few bad decisions in touching, let alone examining, the still-poisonous creature). 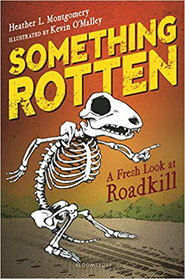 From there, she reveals how her own curiosity led her to discover more about roadkill, and she takes us on the ride with her. Montgomery is a wildlife researcher who shares her enthusiasm at every turn afterward through the southern half of America. Then she takes her show in the—well, on the road across the globe, inquiring of scientists and roadkill fans of their expertise. In Australia, there are biologists searching for the cure to cancer by examining Tasmanian devil carcasses; elsewhere, a scientist who discovered a previously unknown bird species by examining a solitary wing; and even a restaurant that serves up a tasty corpse du jour. Throughout, Montgomery is unafraid to share that science can be gross, and that researchers need to get their hands, um, dirty, to come to any real discoveries. In that, this is a refreshingly honest narrative. I suppose another iteration of this book would have more charts, graphs and—well, maybe pictures, and that would really make this irresistible, but the writing is so good that it's hard to not want to finish each and every chapter. 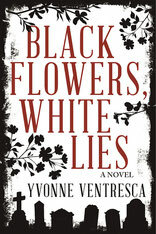 Yvonne Ventresca's riveting Crystal Kite-winning Pandemic was one of my favorites, and in Black Flowers, White Lies, Ventresca proves her broad appeal even as she goes deep into character psyche. She introduces the supernatural connection early on, by having Ella keep her trips to her long-dead father's gravesite secret from her mother. Ventresca masters the psychological elements; because Ella has been keeping her own secrets, she is susceptible to mistrusting others, including her mother, who may not have told her the truth about her father’s death. Then, there's the supernatural symbol: a handprint mysteriously similar to the one she leaves on her father's headstone suddenly appears on her bathroom mirror. Is that a warning from her father from the grave, a sign that her boyfriend isn’t all he seems to be? Or the work of a handful of other characters masterfully placed in the novel? And what does Ella do once the signs and coincidences become more menacing? Especially when the evidence builds that none of this is really happening, and it just might be Ella having a nervous breakdown that maybe, just maybe, her father had endured, as well? Boys need not be afraid of stories told by girls. In fact, they occasionally should dive into that world on purpose. They'll find stories as engrossing as those written with boys in mind, and female characters who in fact share the same kinds of feelings they do. They also will find insight into girls that they often are not encouraged to even consider. This story is one of the best for all these awakenings. I can think of few writers better than Yvonne Ventresca in which boys can find a mystery that moves as quickly, scares as easily and keeps readers riveted. Black Fkowers, White Lies is enormously rewarding for the reader who tries to unravel the mystery one step ahead of protagonist Ella. The title says it all. If you’re at all interested, get the book and read the stories that interest you most. Then try to resist reading the rest of them. My personal favorite (*right now. I reserve the right to fall in love with others as I reread them): “They didn’t succeed—I Survived” a story by ninety-six-year--old holocaust survivor Fanny Starr. 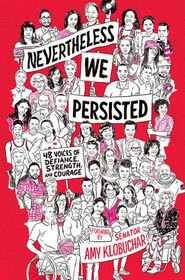 Where others are not quite as strong, there are those, like this one, that make you understand immediately what persistence really means. It gives perspective to those who do not yet understand the word. It may be Andrew Smith's wildest and craziest book yet, but don't let that scare you. It's also more accessible than some of his latest work, which was wild and crazy but also dense. The novel takes place on board the Tennessee, a spaceship orbiting a war-torn, ruined earth. Addict Cager Messer has been transported here by best friends Billy and Rowan to get him clean, but the weirdness on board here is as bizarre as any drug trip he'll ever have. In no particular order, Cager confronts: world destruction; haywire Douglas-Adams-esque spaceships; hyperemotional cannibalistic robots; quirky blue shapeshifting aliens; a bisexual French giraffe (my favorite); pessimistic tigers and self-centered apes with Boston accents; horny robotic personal assistants; enough gender fluidity and artificially intelligent life forms to keep one's head delightfully spinning; and the possibility that he, Billy and Rowan are the last humans in existence (well, until computer programmer Meg Hatfield and her best friend come aboard). This is the kind of book you will want to read if you feel like laughing out loud and reading passages out loud in outrageous accents to your friends, who will then also laugh out loud. And when your teachers show concern that you're having too much fun reading, you'll discuss the ending with them, to show that humor and mayhem are the best ways to confront some of the biggest questions of existence: in this case, what does it mean to be human? 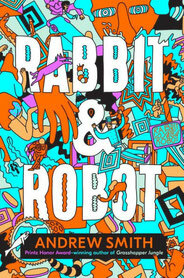 The cover, by the way, tells you a lot about what's inside--a creative conglomeration of stuff all over the place! Only Andrew Smith could write this book and keep it together. I have read and held onto this book for a while now. See, the thing is: it's not for everybody. It's not for someone who hasn't experienced loss, who has never felt anger, who has never been driven by the need for revenge, or who doesn't care to think about consequences. 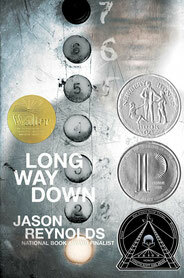 That being said, Long Way Down is a powerful short novel in verse (don't worry, the poetry is not intrusive). When it opens, teenage Will's brother Shawn has been shot and killed. As it turns out, Shawn's death is the latest in a long string of violence that started years and years ago. But Shawn is determined to get revenge. He gets Shawn's gun, leaves his apartment, and takes the elevator downstairs to enact the rules of the street: no crying, no snitching, get payback. What Will is not prepared for during the long trip down is a series of supernatural visits from victims of violence that have affected his life without him knowing any of it. Now, however, he is going to know the truth. Once armed with the truth, will he remain a pawn in an endless game of chess that has no winners, or will he break the pattern and claim life? Long Way Down is certainly Reynolds' most disturbing book yet, but still retains the mastery and beauty of storytelling. It's a nonfiction summer, mostly for middle-schoolers and younger. Each of these books is written with a sense of fun imbued in them, and each is the kind of book kids can pick up randomly and just keep reading. This one includes recipes for rainy summer days, to keep kids occupied in a great way. It's a nonfiction summer, mostly for middle-schoolers and younger. Each of these books is written with a sense of fun imbued in them, and each is the kind of book kids can pick up randomly and just keep reading. This one includes a series of scientific activities for summertime fun. It's a nonfiction summer, mostly for middle-schoolers and younger. Each of these books is written with a sense of fun imbued in them, and each is the kind of book kids can pick up randomly and just keep reading. If you don't know Simon Winchester, you should, for he is one of the finest nonfiction writers for kids on the planet. He knows how to make information interesting and fun, and once you discover one of his books, there are a lot more to come, most of which are easy to find in the library for free. It's a nonfiction summer, mostly for middle-schoolers and younger. Each of these books is written with a sense of fun imbued in them, and each is the kind of book kids can pick up randomly and just keep reading. Is there a kid in America who doesn't love whales? This is not your father's childhood—or even your own. Kids today should at least be introduced to the idea of computer coding if they are going to be full participants in the "world of tomorrow" (which, by the way, is the actually here today). Another book written with a sense of fun imbued in it— the kind of book kids can pick up randomly and just keep reading. Interesting lessons here can give kids a sense of what coding is all about, and the experiments start quite easy. Please see the <Books for Boys> link at the left for the complete list of suggestions from the past 20 years of children's/YA writing.